Last Friday, Corn Stock Theatre opened its production of the classic Lerner and Lowe musical “Brigadoon.” Stan Strickler has this review, for Peoria Public Radio and the Peoria Live Theatre League. Stan Strickler reviews "Brigadoon" at Corn Stock Theatre. Stan Strickler reviewed Corn Stock Theatre’s production of “Brigadoon.” Opinions expressed are those of the reviewer, not those of WCBU or the Peoria Live Theatre League. All of our theatre reviews are available on our web site at Peoria Public Radio DOT ORG. Tim Wyman directs "The Lieutenant of Inishmore," opening this weekend at Corn Stock Theatre. The play is set in the early 1990s, towards the end of the "Troubles" in Northern Ireland. Wyman talks about the dark humor of the script, about how it treats on- and off-stage violence, and about some of the technical challenges he faced in staging this production in Corn Stock's Winter Playhouse. 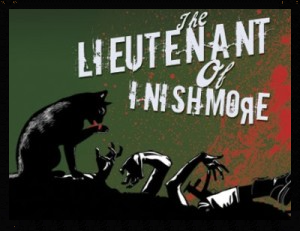 "The Lieutenant of Inishmore" opens tonight, and runs through Sunday, March 29th.